64. Honor the American Birding Association's ethical code for birders. We birders have an obligation to protect the birds we enjoy even while we’re looking at them. Birders who disturb vegetation to get better views of nests risk flushing an incubating parent; when birds fly off their nests in a panic, they occasionally dislodge or hurt eggs or babies. Disturbances at nest sites can also attract snakes, crows, raccoons, eagles, gulls, and other nest predators. Those who walk off trails to chase a rarity risk stepping on nests. Observers stomping through a Long-eared Owl roost can easily disturb and flush these shy birds, which must then search in daytime for alternative roost sites, often while being harassed by crows. Birders descending on a marsh at night may play recordings or clunk two stones together to entice a Yellow Rail to call back, and then surround the bird until it flushes for everyone to have a view. This technique can damage habitat, destroy nests and eggs, or even injure an adult by causing it to collide with a tree or a birder in the dark. At an American Birding Association convention in Duluth in 1988, birders descended on a nearby marsh and flushed a Yellow Rail, which was caught in midair by one birder. An article published in the June 1988 issue of Birding described the sound of the rail hitting the birder’s hand as a loud “thwack.” The writer added, “Ooh, I’ll bet that one stung his hand,” without even speculating about how that impact would have felt to a two-ounce bird. 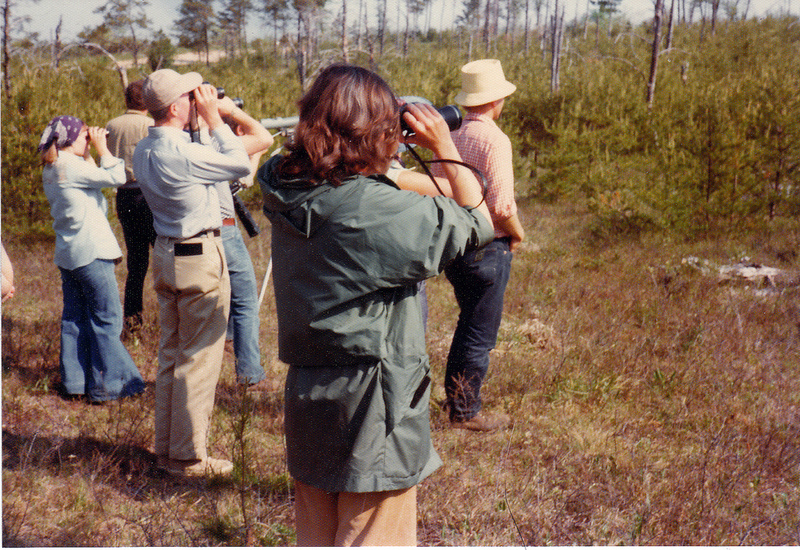 Birding activities can also become a nuisance for other people, both birders and nonbirders. When huge numbers of Great Gray Owls descended on northern Minnesota during the winter of 2004–2005, over a thousand birders from all over flocked to see them. One morning while driving down a couny highway, I came upon a birder cussing angrily. 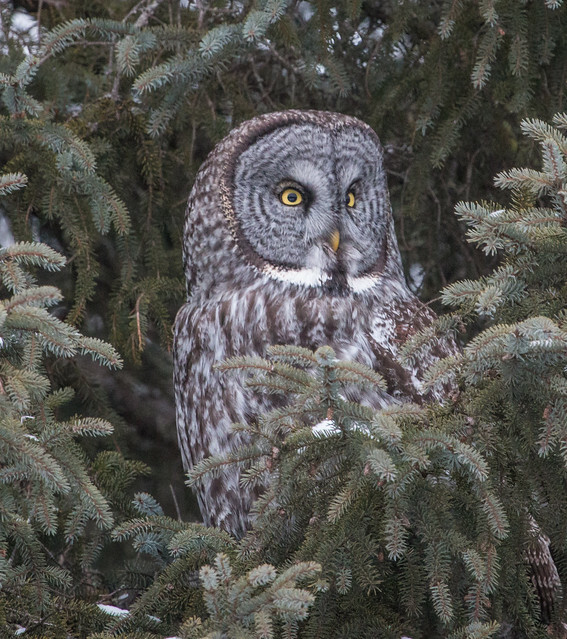 He had just seen his first Great Gray Owls—two sitting right next to each other. After allowing several people to view them through his spotting scope, he had set up his camera to digiscope them. Suddenly, another car pulled up and two people jumped out. They slammed the car doors and ran right between the camera and the owls, causing the birds to flush before the birder got his picture. He was understandably furious. These same throngs of birders upset many local people in the area. The closest town, Meadowlands, has a population of only 766, and people living out in the woods don’t expect to have to deal with so many strangers driving the back roads, often training their long lenses directly toward window feeders. The problems were exacerbated because the owl invasion came during a time when the government was issuing terrorist alerts. In one instance, someone spiked the roadside to flatten the tires of unwelcome cars, and someone else painted threats on his garage against any birders found in the vicinity. When a community is angry about birders, that antipathy may extend to the birds themselves, which can harm conservation efforts and put the birds in danger. Although spiking roadsides and issuing threats are extreme, not to mention illegal, it’s also unacceptable for birders to disrupt the lives of others. Limit the use of recordings and other methods of attracting birds, and never use such methods in heavily birded areas or for attracting any species that is Threatened, Endangered, of Special Concern, or is rare in your local area. Keep well back from nests and nesting colonies, roosts, display areas, and important feeding sites. In such sensitive areas, if there is a need for extended observation, photography, filming, or recording, try to use a blind or hide, and take advantage of natural cover. Use artificial light sparingly for filming or photography, especially for close-ups. The American Birding Association’s Code of Birding Ethics may be freely reproduced for distribution/dissemination. Please acknowledge the role of ABA in developing and promoting this code with a link to the ABA website. Thank you.